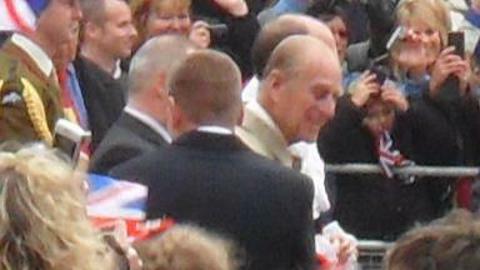 People turned out in their thousands on Tuesday, to see the Queen and the Duke of Edinburgh, who were visiting Bromley as part of the Diamond Jubilee tour. The rain and cold were not able to dampen people’s spirits, or the carnival atmosphere, as the crowds waved their union flags and local school children cheered as they greeted the arrival of the Royals. A local shop was giving away strawberries and cream which proved very popular. As the Royal couple arrived, the sun came out to everyone’s pleasure. After walking through the Glades Shopping Centre they were presented with a gold clock and flowers from Bromley traders. They then spent ten minutes talking to individuals in the crowd in the market square. After leaving Bromley the Royal couple left for St Mark’s Academy in Merton on the next leg of their tour. East London Lines spoke to Katie Smith, 41, from Catford, who said that it had made her day and couldn’t believe that she had seen the Queen in the middle of Bromley. 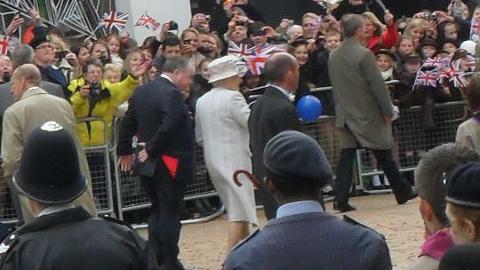 Our Lewisham reporter, Delores William, was in Bromley and spoke to some of the people who came out to see the Queen.